Our latest invention Unitiator is an innovative smartphone app in which restaurants, cafeterias and bars offer things like free drinks and small dishes. Chose an offer? Then you spend some time in the chosen place. Your very presence will improve the appeal of the venue to passersby, whom are potential customers. This way you help the place, and have a great time all at once. The Unitiator concept is based on 'social validation': empty venues repel potential customers whereas venues filled with people are more attractive to anyone. The concept also brings people to venues on a very short notice, so that venues that are empty have people very fast. The offers are always free things, so that who accepts offers have fun while giving their time in exchange. We have already started developing the app. See a teaser here. We plan to launch as soon as of March 2016. We feel confident about it, having spoken to around 50 potential customers. The majority is enthusiastic about contracting Unitiator. We love that they confirmed how the social validation works: they put their own people on their terraces at times, to attract customers. With Unitiator they can have real customers immediately. We're also proud to have partnerships with Load Interactive and Startup Foundation. Other than that we have a group of 7 individuals attached to Unitiator as partners and advisors. the first marketing campaigns to make Unitiator known. When you choose to invest in Unitiator, you become part of an exciting startup. With your help we get venues to have the clientele they deserve and people to discover new great places in town. Ah yes! And we expect to get break-even already just after the 2nd year of activity. We will continue to invest in our growth and sustainability, so that we can start sharing profits with you after the 3rd year of activity. By that time the company is expected to be valued 5 times the current valuation, so you can expect a return of your investment of more than 100% a year. At any point in time, you can sell your share. Márcio is a 35 years Portuguese living in Rotterdam with his Dutch girl. He is a super social person, with a proactive spirit, trying to gather and connect people. He studied economics, being interested in understanding social behavior and managing society better. He caught himself passionate for collaborative consumption, finding ways in which to share stuff and diminish unnecessary consumption. Fábio is a 34 year old Brazilian, living in The wonderful Netherlands since 1998. He loves (and is extremely good at) giving legal advice to businesses. He is a sociable, charismatic and diligent person, comfortable working in a multicultural environment. He enjoys watching soccer, playing volleyball, running, and travelling. Raoul is a natural board entrepreneur. He is in the vanguard of data, business intelligence and internet-of-things. Currently he is a consultant in the fields of marketing and communication. Good to have him on board! Eduardo is an out of the box thinker, coming up with original advice. That makes him a genuine problem solver. Lawyer by profession, but always up to date with the latest tech trends as a bonus. Pro bono! Nuno is a super persistent person fighting hard to reach his goals. He is a university teacher in Behavior Economics and Marketing. That makes him home in the material of Unitiator. Marcos is a hyperactive person by nature. We are happy he joined us with his tech knowledge as a software programmer. He has a tick for smartphone applications and knows all about app user engagement. Always willing to learn from new ways of thinking, Vicente counts with live experiences in Spain, Japan and The Netherlands. Passionate about sports and business, he is specialized in sports and leisure management. Our financial expert is reliable, emphatic and a solid performer, always waiting for the next challenge to come. Unitiator is an innovative smartphone application in which bars, restaurants, and snack bars post offers. Anyone can accept an offer, like a free drink or a small dish. In exchange, they spend some time in the venue. Just by being there, they make the place more attractive. That's called 'social validation'; when people see other people on a terrace or in a venue, they feel it's more cozy and a higher quality place. If there are none, the chance is bigger that they will skip it. That's how perfectly fine venues can be empty for some time, while the neighbor has a full terrace. Unitiator aims to jumpstart customer rates and give people a good deal at the same time. So how does it work? If you use the app, you have access to offers from the places near you (in the same city). Using geolocation this can be more accurate. If wanted, you can be notified of new offers near you. Reviews of the venues and of individual people taking offers will help getting good matches for both. Genuinely bad quality places will be excluded and the same goes for those taking offers. The only thing in exchange for an offer is time. When taking an offer, people also accept that they stay a reasonable amount of time in the venue. Venues choose the maximum number of people that can take one specific offer to prevent them from going broke. Side effects of the deals are: if the experience is good, people will share it within their networks, exposing the venues (medium term). There's also a large chance they will consume more after the offer has been taken. Unitiator brings representative people to venues on a very short notice. The same evening if necessary, when the terrace or restaurant needs filling up. That's unique about us. Another unique selling point is that we make use of the social validation, an idea that many bars and restaurants subscribe. A third novelty is the idea that users of the Unitiator app give some of their time to help out venues, as pioneers and well-doers. We use the online community on smart phones to match with offline businesses. It has some philanthropy and that makes people feel good about themselves. Another very important premise of Unitiator is that the offer is always something for free without any other strings attached. No paying for unexpected goods or services, no discounts; always something free simply in exchange for spending some time in the venue. Only if the person taking an offer wants, he'll consumer other things for pay. Restaurants, cafeterias, bars – payment for 3 months, 6 months, 1 year for an unlimited usage during that time. A pay per usage model is being considered and will be tested. Campaigns with brands – Paid customized campaigns for brands wanting to promote their products, involving both users and businesses. Premium users – A fee for which they receive offer notifications before regular users do, as a benefit. Publicity: Establishments have the possibility to be highlighted on the map and appear first in the list users will see. The service can easily be implemented in basically any city. We start in Rotterdam and soon grow to other cities in the Netherlands, and then abroad. Only the language needs to be adapted, but we will adjust other parts of the concept if it turns out that works better in other countries. When Unitiator is a powerful online platform it does not need local servers, making it possible to provide the product at large distance. The expansion strategy consists of always having local staff with extensive knowledge of the market who understand the characteristics of Unitiator’s potential customers. The launch of Unitiator in a new city/country will be accompanied with creative marketing campaigns. After getting the first customers in each city and with the growing awareness of the Unitiator brand, other people and venues will be more easily convinced to join us. A nice snow ball effect. Unitiator can also work in other business. Stores / retailers deal with the same effect of social validation. An empty store will only be entered by pioneers, while a full(er) store feels more comfortable to enter for other customers (followers). This gives a huge potential for the future of Unitiator. The app Unitiator is now being built by a developer. It is expected to be ready in March 2016. We develop it for Android and IOS (Apple) systems. Meanwhile we are already talking to venues to join us and make great offers. We’ll start with the Minimum Viable Product, a powerful basic version to reduce technological issues. Further on we will develop the product according to the feedback we get from the market. Have more information from the businesses and users so we can understand their needs. Categorizing both makes it a more suitable match. Programmed offers for specific moments, either by default or not. The ability of users to send out proposals of offers to venues in a user-friendly and fast way, with no extra work for businesses. This will be based on the person's bargaining power, like the number of peers he can bring along. Premium service for users, where they can be informed about offers before regular users are. Dynamic premium service, where hostels or Airbnb hosts can acquire several Premium subscriptions and pass that privilege to their customers and guests. Unitiator aims for companies in the food and beverage sector: bars, restaurants, snack bars, pastry shops. Any place where people can be seated and let social validation do its work can be Unitiator's customers; our first target group. Within that target group we see the highest chances for those venues that have passersby. Of course, it works best if there is a terrace or a window through which those passersby get a glimpse of the venue and of course the people inside. That's the best situation for the social validation to work its magic. We noticed from our conversations with venue managers that Unitiator can have a super strong effect for new ones. Venues that yet have to gain a 'fan base' in the city and a good reputation. We can help jumpstart these new venues. On the other hand we are looking at the public to go take the offers. They form our second 'target group' of marketing. Without outgoing, culinary appreciators there are no deals. Unitiator is appropriate for all ages and we welcome all, yet our main target group is male/female between 18 and 35 years old, living in urban areas. Younger users will be banned from taking offers of alcoholic beverages, but we place no other limits in age, gender, or location. We count 25.000 venues in the Netherlands that in theory could take the best benefit from Unitiator (Total Available Market - TAM). 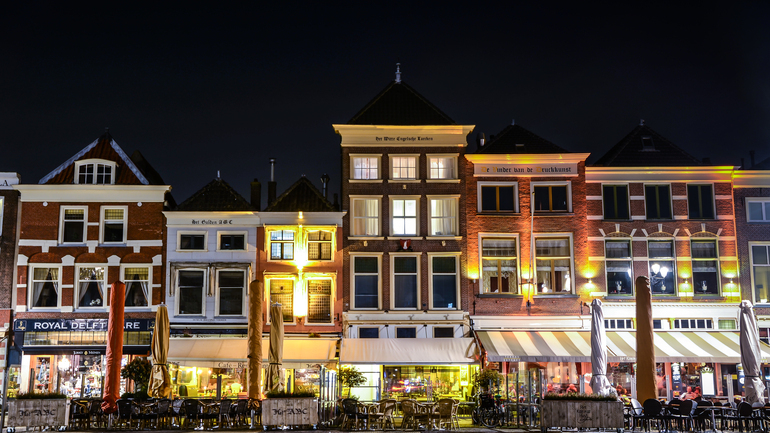 Those are the bars, restaurants, and cafeterias in urban areas within the Netherlands that have passersby and a terrace and/or an open view inside their place seen from outside. The Segmented Addressable Market, the sample of TAM we will target with our sales channel is about 4.200 places. Unitiator would be realistically able to reach 700 venues using us to post offers. That's the Share of the Market (SOM) we estimate to have at the point of market saturation. After the first year Unitiator expands to cities outside the Netherlands, one at a time. Of course we will estimate the market in each city before going there, so that we adjust our commercial efforts and marketing campaigns accordingly. Unitiator is a unique product not having direct competition. There are no other companies doing exactly the same. We are proud of the unique selling points that we mentioned above. We do have indirect competition, though. Those are services that seem similar at first glance. The differences become clear once you look closer. However, first impressions are defining so we take those competitors seriously. Some of them fish in the same pond and might prevent our customers - the venues - from loving Unitiator at first sight. IENS is a smartphone app, and webpage, that let's its users book restaurants and get other services. Let's people book tables and order gift cards. We instead aim to two types of potential clients of the establishments – the users of the app, and the passerby they can attract. Competitor status: Moderate, we fish in the same pond, but offer different things with a different goal. The essential idea behind the product is to inform the user about offers for drinks at bars based on his location. When the user is within proximity of a “smart” bar he receives a message with an invitation for a special offer (usually discount or second drink for free if consuming the first). Offers some discounts, Unitiator only offers things for free. Competitor status: Moderate, both are exploring the technological advantages of a smartphone, but the focus is different. For more information about this chapter, consult the attached document "Competitive analysis Unitiator". As long as the application is still being developed, there are no customers yet. Though, there are several potential customers showing intentions of becoming it as soon as the product is ready. We give examples of some of the first: Opporto, Mr. Cone, Dely Griek, Evin Restaurant, Bom Gosto. In our calculations, result of the interaction with restaurants and cafeterias in the market research stage, we expect to get an average of 70 new customers per month in the first year, 88 in the second and 94 in the third. Aside of the new customers collected every month, we account a percentage of the ones that will renew their subscription with Unitiator. The goal is to have more than 600 businesses on board by the end of 2016 and a substantial enough enthusiastic critical mass of users taking every offer posted by the businesses. Unitiator is meant to jumpstart the activity of the venues, having a bigger impact in slow/dead hours. By bringing people on demand on a very short notice, Unitiator creates several effects with an immediate and medium/long term effect: it increases clientele. It also helps the establishments to become more socially responsible and environmentally friendly. Simply by using Unitiator for the last opening hour they can reduce food waste. This way they make meals available to the app users, that would otherwise be left unconsumed. We contacted more than 50 businesses in Rotterdam, Amsterdam and The Hague and more than 200 potential users. The results were very encouraging and led us to the point we are now. We have designed the smartphone app and researched the various options it could have. We have reflected those within our networks to see which spark enthusiasm. Right now our partnering programming bureau develops the app. The beta version should be ready in February 2016. The marketing will be used to bring more app users and customers, in different forms: - Search Engine Marketing (SEM), Social Media Marketing (SMM), Brand Campaigns, Search Engine Optimization (SEO) and Media Bannering. For the potential customers, the sales channels will mainly be commercial activity in the field contacting them in person, complementing the interaction with phone calls and emails. Other ways include news articles in specialized magazines and through partnerships with companies having the some profile of customers as Unitiator. Being an active part in an event or even organize an event where we can present the concept to a big number of potential customers at the same time is a possibility when starting a campaign in a new city/country. SEO, SMM, SEM will be employed from the launch of the product and during the entire course of the company with the goal of attracting more users and businesses and creating brand awareness. The commercial activity will start approximately two months before the official launch of the product. The goal is to have more than 600 businesses on board by the end of 2016 and by then we should have around 4200 users taking every offer posted by the businesses. We are developing other special partnerships with different natures, particularly with companies with complementary services for our potential customers, so we can study synergies. Based on the trustful market research performed with potential customers we estimated the needed time dedicated to get a customer. We considered the different stages of the process, and the available human resources dedicated to commercial activity. We took into account different sources of colleting customers, being them face-to-face, phone calls, emails, different marketing approaches and combinations of them. We also took into account the limitation of the market in each city and the need to jump to the next one. The result is the expected number of customers contracting the service per specific month. We are aware of the thin balance we will have to keep between the number of users of the app and the offers being available (customers) per specific city. To work towards a balance we will gather real time data to allow us to focus efforts on increasing our critical mass of app users or try to increase the number of customers in a given city. Added to that we estimated the premium paid users per month (with data gathered with the market research with potential users of the App). These assumptions are based on a non optimistic scenario where most of the customers would need to be contacted directly by our initiative and in the majority of situations in person. The investment made to the moment totals 18.000 Euros brought directly from the pockets of the partners. This amount is covering the first stage of the development of the technological solution, which is ongoing. The total amount of funding required for the product in the market and to start having a positive monthly balance is 47.000 Euros. This amount corresponds to 16,8% of the shares of the company. According to the report of the specialized company in valuations (Equidam), Unitiator’s value at this stage is set to be 380.000 Euros. Although Unitiator’s partners believe in the extraordinary potential of its product and company, they decided to lower the total valuation to be considered in the crowdfunding to a total of 280.000 Euros. This amount is used to calculate the shares the investors are entitled to. The motive behind this dare decision is that Unitiator’s partners agree on the difficulty to estimate the value of a company that still doesn’t have revenue, and any value given will never have a big certainty level. Once the majority of the investors will come from the network of the partners, they want to give better money for value (faster and bigger return) to the first visionaries. This is meant to show the great appreciation they have for the fact these ones also believe in the challenging endeavor. Still in the first year, we consider the possibility of reinforcement of capital injection by finding a suitable strong investor bringing knowledge, network and new perspectives. For the second year of activity, there’s a possibility to raise more capital by running a second crowdfunding campaign, this time with a higher value of the company. Every of these inputs of capital are meant to bring more strength to the startup making it able to grow faster and more efficiently. Once investing in the company at this early stage, you’ll have the chance to multiply your capital according to the continuous growth value of the company and/or through the distribution of profit. The value of the company at this stage is set on 280.000 Euros and after the 1styear of activity, with more customers and more awareness of the product in the market it is expected that the value of the company will more than double. At a certain point in time if you desire to sell your shares, you can do it facing a return of the investment according to the difference of what you paid and what someone is willing to pay. If and when there’s another crowdfunding campaign later in the future you can sell your shares according to the established value of the company in that moment, that certainly will be higher than this initial stage. For the investors of this crowdfunding campaign, once the company reaches the break-even point, partner Márcio Leite predisposes himself to acquire the shares in case someone is interested in selling them, with a valuation of 15% a year over the base price set in this crowdfunding campaign. For the dividends, after the 3rdyear of activity, and once making the company solid enough, and still constantly reinvesting the profits towards making it bigger, we’ll start sharing profits to the partners. The percentage of profit dedicated to dividends will increase with the years. As any startup, we are forced to face the “death valley curve”. In the case of Unitiator we consider this death valley to be the first two years, where we are still growing relatively slow and with little margins for mistakes. This is the period where the company needs funding and all courageous efforts to thrive in the market by breaking the resistance with potential customers. Time and money are being dedicated to an activity that doesn’t give any guarantees of being successful at the beginning, even if a thorough market research was done. In this period we are going to need more than the best practices in management, marketing and sales, so we are bringing all our passion, confidence and tireless superhuman energy to keep ourselves motivated and make it contagious to any person or entity in our path. There are risks involved indeed and we are aware of them. If the numbers will not go according to the plan, we will analyze, rethink, redefine the best strategy with thelessons learned from the interactions in the market, reinforce, and get back to the battle with a fresh mind. Parallel to the normal activity we’ll be making sure there are always enough investors, enough enriching partnerships and enough alternatives to go further.